Stop Texting While Driving! Let Mobliza handle it for you! Do you text while you drive? That’s insane! But how will you quell your desire to respond to all those never-ending beeps and bleeps coming from your phone? Well, my latest Windows Mobile app, Mobliza, now available on the Windows Mobile Marketplace, will cure your ills. 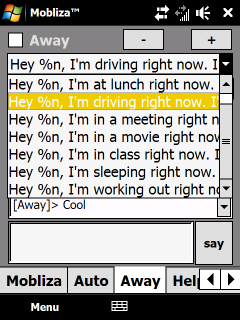 Mobliza will automatically respond to your text messages with any text you choose. 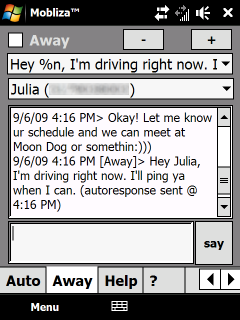 You can even automatically insert contact names, the current time and date, and create custom messages per contact. You can even set how Mobliza responds to different people! Bored, and don’t know what to say? A cool feature in Mobliza is her Auto mode. Turn on Auto and Mobliza will actually try to hold a conversation with texters, keeping them busy so you can concentrate on driving, the meeting you’re in, the movie you’re watching, and more. Mobliza’s now available for $1.99 in the Windows Mobile Marketplace, which you can get for Windows Mobile 6.0, 6.1, and 6.5 phones. The download link is here. I’ve also set up a full support site at http://community.mobliza.com. Enjoy, Happy Holidays, and Safe Driving!